HSINCHU, TAIWAN--(Marketwire - Nov 1, 2012) - Taiwan's medical devices industry in 2011 generated output of nearly NT$100 billion, and despite weak global economic growth, output is expected to expand 7% in 2012, in part from an initiative by the Ministry of Economic Affairs (MOEA) to promote backbone enterprises in the industry. The MOEA's Industrial Development Bureau (IDB) has organized the two-day MEDiT 2012 with the aim of assisting local brand name medical device companies to forge inroads into emerging Eastern European markets and to forge collaboration with international pharmaceutical heavyweights, thereby creating blue ocean opportunities. Vice Minister of Economic Affairs Woody Tyzz-Jiun Duh commented that his ministry has pinpointed five areas to form industrial clusters and develop high-end brand name products, namely kidney dialysis care, respiratory care, in vitro diagnosis technology, minimally invasive surgery, and high-end dental technology. The initiatives in this regard will enhance Taiwan's international competitiveness and will help Taiwan's high quality, but reasonably priced medical device products find appropriate markets. In addition, Taiwan will become an important supplier of key components and in the process become part of the global supply chain, which will create even more business opportunities. Dr. Shau Yio-wha, Director of ITRI's Biomedical Technology and Device Research Laboratories, pointed out that Taiwan's producers of medical devices already offer products with outstanding technology and quality. Given huge opportunities in emerging markets in Eastern Europe, such as Russia and Poland, which are presently replacing older devices, Taiwan is poised to fill the demand with its top quality, but reasonably priced products. 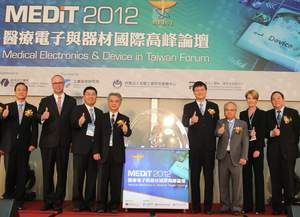 Dr. Shau added that MEDiT 2012 will offer a platform for interaction with international medical device heavyweights to help local firms enter those markets. Dr. Shau furthermore stated that Taiwan has long been recognized for its expertise in testing medical devices, and in the future it is poised to play an important role this field in conjunction with the development of new medicines. Industry representatives from the United States, Germany, Japan, mainland China, and Singapore have been invited to speak at this year's MEDiT. Ann Costello, Vice President of Business Development and Strategic Planning for Ventana Medical Systems, a member of the Roche Group, which is the world's largest supplier of blood glucose test strips, will share her company's experiences and observations in the in vitro diagnostics market. Dr. Martin Schloh, a partner at PricewaterhouseCoopers, will discuss the successful sales experiences of medical device companies in emerging Eastern European markets. Dr. JP Stephan, Senior Research Scientist for Genentec, one of the world's largest biotech companies, will analyze how medical devices can be used to hasten the development and commercialization of new drugs. Also, Mr. Bai Zhipeng, Chairman of the China Continua, will explain how the two sides of the Taiwan Strait can create opportunities by standardizing specifications for medical equipment used by the Chinese.